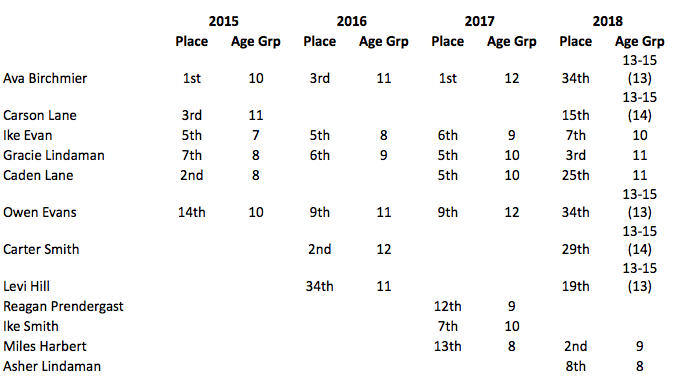 Below are the results for the Ankeny triathletes at National Championships the past several years. Some of these athletes are looking to win a national championship again this year. Once an athlete turns 13 they began to race draft legal and the age group is combined with 13 thru 15-year-olds competing in the same division. Youth age 12 and younger race non-draft and against just their age group. The last column shows those competing in the 13-15-year-old age group and their age is in parenthesis. The National Championships are held annually in Cincinnati in August. All of these athletes are part of the Z3 team, which is a national youth triathlon club in Des Moines. The team has been ranked as the top team in the nation several times during the past few years. These athletes have also competed in the Rip Roar youth triathlons as well, and many of them have won multiple individual race championships and season championships in those races. Other Ankeny athletes such as Riley Prendergast have also raced in this series.